In the USA, interest in Intellectual Property has reached fever pitch. High-tech companies often have their own in house IP counsels, and heaven forbid that they don’t have their own individualized and unique IP management strategy. Why is this the case? Decision-makers have realized that intellectual property is the lifeblood of a modern high-tech company; especially for those that wish to do business internationally. In these times of saturated markets and increasing competition, companies are forced to be innovative to survive. This is reflected in the tremendous increase of worldwide patent filings seen in recent years. Law courts have become favourable to IP, especially in countries like the US, where massive payouts, occasionally on the order of billions of dollars, are becoming commonplace in infringement settlements. When companies develop a promising product, they need to consider whether it would be profitable to market it to the big international markets, especially the US, Japan and the EU. If so, the company needs to secure legal protection for the products to be marketed, to prevent intellectual property theft. Traditionally, an inventor would look for such protection by applying for patents in each individual country where the product would be sold, manufactured or distributed. This results in a tremendous outpouring of time, effort and most importantly immediate expenditure. Most countries for instance have their own filing requirements for formalities – they may require particular page numbering or margin adjustments and so on. Compounded with that is the fact that inventors cannot usually use their own legal councel to submit patent applications in the designated countries, instead they must hire the services of counsel registered in the territory of choice. This causes expenditure, which is made worse when one considers that most territories will also require up front filing fees. An international treaty exists however, which is able to simplify the global patent application process. This treaty is the Patent Cooperation Treaty, or PCT, which provides an efficient and cost effective way of patenting an invention in many different countries simultaneously. The PCT has two primary functions, which are firstly to expedite the filing of patents internationally (to all signatory countries) whilst minimizing the costs of such, and secondly to allow complete and unrestricted public access to the thousands of published inventions currently in the database. The PCT Gazette also offers information on the latest inventions, such as those just filed. 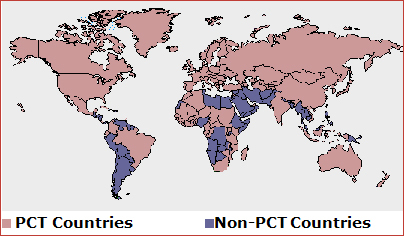 Under the PCT, an inventor is able to file one international patent application, and designate with that any or all of the currently 127 PCT Contracting States (a recent amendment to the PCT means that any application to the PCT covers all member countries unless the applicant specifically does not want to designate certain countries). This allows the applicant to simultaneously seek patent protection in many countries worldwide. The effect gained by the applicant is the same as an individual application to any of the designated countries (The international filing date received on application to the PCT is recognised by all the PCT member states as if the application had been directly to them individually. Initially, the application to the PCT need only be written in one language, which also helps delay costs for translation. The filing requirements are also uniform across all the member states). Patent options can be kept broad; by designating all the member states, strategic withdrawals from unnecessary states can occur whilst the application is still in the PCT system, thus allowing the applicant to develop his or her patenting strategy without incurring cost, and wasting money on unnecessary applications. Also, amendments made to the application during the PCT international phase apply uniformly to the application sent to all of the designated countries. When applying for a patent in any jurisdiction, the applicant should work with a local Patent Agent to negotiate the pitfalls of the search and examination processes. The examination process may take years, depending on the country, incurring cost, when ultimately the patent office may reject the application. If several countries are in question, then the time and money wasted can be significant. However, if the application is made through the PCT, the applicant will receive an international search report, listing relevant prior art on subject matter relating to the invention within a few months of filing. The applicant may then estimate his or her chances for success in the application. Additionally, the applicant may choose to obtain a preliminary examination report, which will describe with greater surety the likelihood of the invention proceeding to grant. However, many PCT countries require full examination of the application regardless of the result of the International Preliminary Examination. An application with the PCT can afford the inventor an additional 18 months of safety for their invention before paying for a patent application in any individual country. This provides the applicant the time to explore commercial opportunities worldwide without the immediate need to commit. Following the PCT international search report, the applicant has another opportunity to delay the prosecution of the invention into the various designated countries. This is achieved by requesting for an International Preliminary Examination, which provides its greatest benefit to the applicant as a method of gaining an additional 10 months before the patent must be prosecuted in the designated countries or abandoned. By this time, the applicant will have gained a good sense of whether the invention is patentable, whether any licensing opportunities are developing and how the invention is faring in the marketplace. The costs for filing a PCT application are considerably less than those expected when filing a patent in several different countries, because only one filing is necessary. Only one set of fees are required, which covers filing, searching and publication of the patent application. A second fee is payable if the applicant desires an International Preliminary Examination. When the application reaches the national stage (after PCT acceptance and publication,) national fees must be paid in the countries designated. It should be noted here that certain national offices offer fee reductions to those applications entered through the PCT, due to preliminary search and examination results having been accepted. Many others do not offer the same. Fees can also be saved in other arenas such as in circumventing tricky territorial laws. For example, unity of invention requirements in the US are usually extremely tight. This means that the US Patent Office prefers to receive patents which are endowed with only one single inventive concept, whilst a group of inventions may be accepted in one single patent application in other jurisdictions such as the EU. Often by using the PCT as the application route, such unity of invention rules may be less restrictive, and the applicant can save money on the final number of applications necessary. Finally, companies may see interest returns on their capital when they are able to postpone national filings. Malaysia is yet to accede to the PCT as of writing, though there is much demand from both within the country and by foreigners wishing to file patents in Malaysia to ratify the treaty. However, PCT filings are still possible, through the use of local Patent Attorneys in Malaysia. Government bodies have recently stated that it is likely that the Malaysia will become a member of the PCT before the end of 2005.